After getting my almost weekly massage from UCMT I was feeling hungry. My nephew, Nick, and his girlfriend had raved about at place in Provo near the old Los Hermanos restaurant called Station 22. Since I had time I talked my friend, Chris, into trying it out. Let me just say that I am not one of those guys who loves a greasy spoon, hole-in-the-wall, kind of place. The location was kind of screaming that that is exactly what it would be but I'm open-minded and willing to check out a place at least once. I was pleasantly surprised. The atmosphere was super cool, very hip, and felt kind of big city. (Not that I really know what "big city" is.) Their menu wasn't large but the items all sounded unique and worth trying. I had heard that the Freedom (French) Dip was good as well as the fries. I don't think the Freedom Dip was available today so I asked the cashier what her favorites are. One that she suggested was the Memphis Fried Chicken Sandwich pictured above. It sounded tasty and added the fries and a soda to make it a meal. 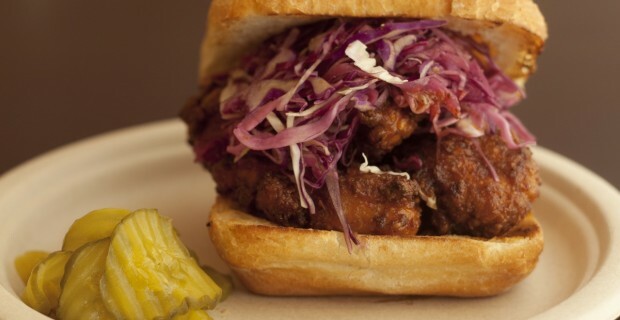 Here is what The Memphis is: a hand cut, battered, & fried chicken in the Memphis style, then glazed it with a spicy butter sauce, topped with fresh slaw, and served it on a ciabatta roll. Yum! They also had some cool free waters. One was very lime infused and the other was watermelon and some herb. They were both pretty refreshing and unusual. I highly recommend it. The prices are not bad but not super cheap either. I paid around $12 for what I ordered. See my photos below.